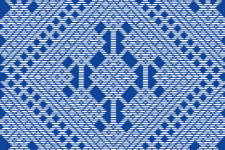 “Koginzashi” is one of Japan’s top 3 sashiko and is a technique transmitted to Tsugaru District, Aomori Prefecture. A charming feature is a design that stitches thread so as to close the rough cloth texture of hemp cloth. The top 3 sashiko in Japan is Tsugaru Koginzashi · Nambu Hishizashi · Shounai Sashiko. The former two sashiko began with making workwear with only hemp, because of hemp was only one fiber that could be self-sufficient in this area. These area are cold area in japan, so they had to devise durability and heat retention with hemp clothes. That device was stitches. Meanwhile, Shounai Sashiko was not satisfied with the self-sufficiency of clothing, but because of the distribution of goods in Kyoto and Osaka through the Sea of Japan,They ware able to get old clothes from the city. Shounai Sashuko began with making these durable clothing by piercing these old cloths irrespective of the texture of the fabric. Stitch like Shounai Sashiko can see the roots in” Sashinou “,” Sashi Tsukuroi “,” Tsukuroi Nui ” in Asuka era. 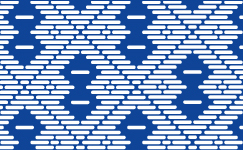 From this time Sashiko is considered to exist all over Japan. However, Koginzashi and Hishizashi are Sashiko who has developed its own unique development which can not be seen in other regions. 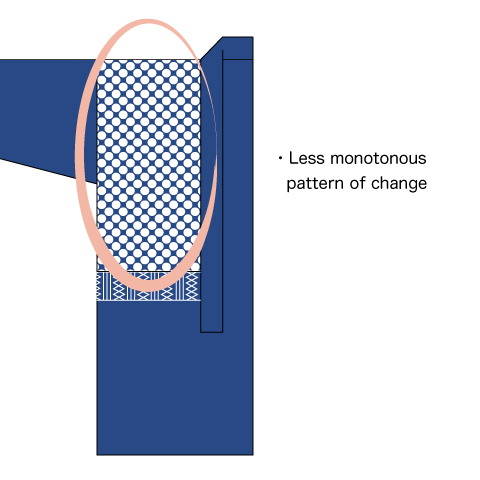 Koginzashi and Hishizashi say “grid closing stitch” in Sashiko, a technique of a characteristic that stitch threads while counting the grid of the cloth texture and stacks the patterns one by one, a technique is applied to a rough cloth with thick thread I stitch the thread so as to close cloth texture. Koginzashi is known as traditional crafts nationwide because relatively older materials remain, and since the early Showa era has been actively pursuing inheritance as a regional traditional industry. On the other hand, Hishizashi has not been known yet and may be incorrectly known as one of Koginzashi. However, the local women continue inheriting to the steady and there are 400 kinds of patterns. Both Koginzashi and Hishizashi are loved by many as one of the hobby handicrafts that anyone can enjoy easily now. Nambu’s “hishizashi” and tsugaru’s “koginzashi” which made unique development among sashiko. These name seems to be a different thing. 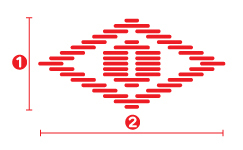 In these two, differences in features are found in the composition and color of the pattern, but the base method is the same, there are parts in common too. The nambu area where the hishizashi developed was east side Aomori prefecture and up to the northern part of Iwate Prefecture. but, this hishizashi is almost only seen in the area in Aomori Prefecture. It is not clear what kind of historical relationship the two sashiko had. 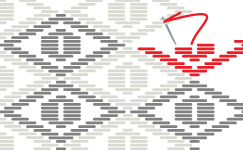 “Kataco” which encloses the motif with a rhombic frame which can be made by horizontally shifting stacked stitches by 2 grit each. 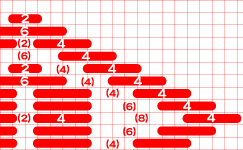 The motif grit ratio is vertical: horizontal = 1: 2. “Kataco” are aligned one by one making. 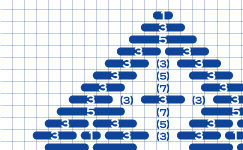 Stitch grid of Kataco consists of an even number. About 400 types or more. 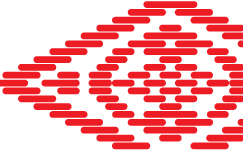 These motifs has a silhouette like a curve or a circle. Originally, linen cloths to be stitched was light light blue color. In addition to cotton thread, synthetic fiber, blended yarn and etc for use. And color is rich. The origin of hishizashi is presumed 200 years ago from now. Until 100 years ago, The climate of Aomori prefecture is much different between west tsugaru and eastern nambu. Nambu, against fertile tsugaru, was not easy to get sashiko thread because it was an area where crops do not grow well . Even if cotton fabrics are being circulated from the Kanto since the railway was opened in Meiji, the suffering of farmers’ lives did not improve satisfactorily. 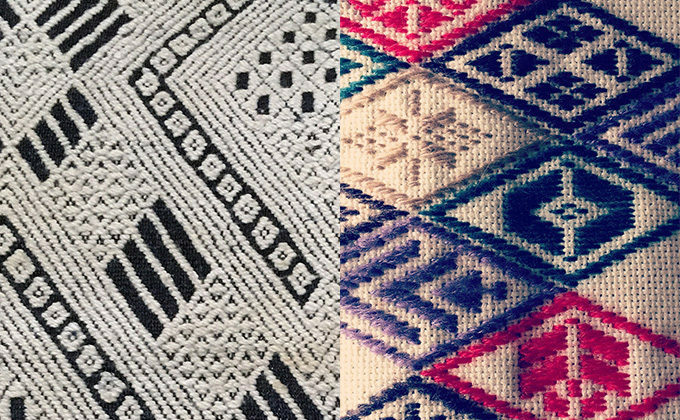 I can recognizes the difference in color and material in each one of the motifs in Nambu Hishiashi. And it is the spirit of trying to use up precious and valuable threads carefully. Hishizashi was mainly stitched on the shoulder of kimono, apron, thighs and gloves. It is said that the apron was actually used until the early Showa era. 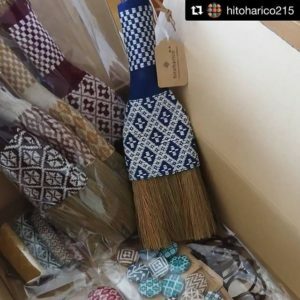 ※On this site, we will provide information on Hishizashi at the same time, because not only koginzashi but also hishizashi is a same technique sashiko that can be easily enjoyed with the same material. Kata-ko of hishizashi motief is given a name taken from familiar animals and plants.You can see these at modoko database. 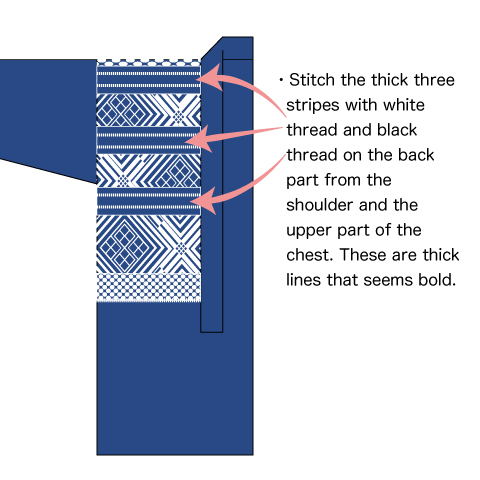 Make a pattern by putting stitches one by one in the entire width of the fabric. 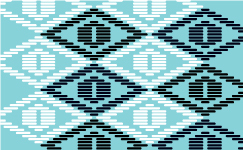 Contrast of two colors that white cotton stitch and indigo dyed cloth. 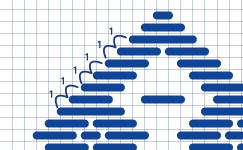 The composition of the foundation pattern (Modoco) consists of counting an odd number thread of fabric grid. Depending on the arrangement of Modoco make a bold pattern composition on the full of cloth. Modoco is a diamond shaped to be shifted one by one regardless of its size. 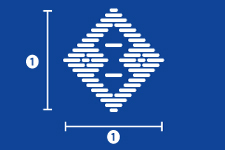 The aspect ratio of the cloth grid is 1: 1. ※The name of modoco is named from the living environment, and it is still used as the name of the dialect of Tsugaru as it is today. In addition, it is also one of the fun of kogoinzashi to make combo patterns freely by applying modoco and Zizashi when you can familiar it. Koginzashi is stitched to workwear for farm work. It is classified into three types in the difference of how to arrange patterns by region. 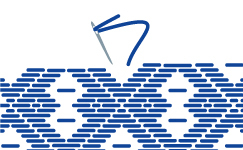 In this area, there is a characteristic that black threads and white threads are alternately stitched on the shoulder portion, and horizontal striped patterns are applied. This is to prevent friction when carrying heavy loads. Also, in this area, there were many delicate fine clothes woven with fine refining threads, and it was thought that it is high quality and good for formal dress . 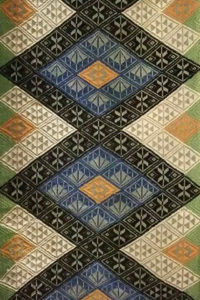 Also, many horizontal patterns incorporating the motif Sakasakobu under the striped pattern were observed. 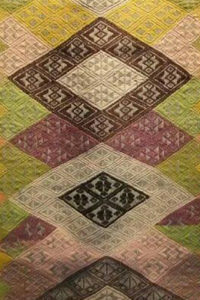 This pattern was stitched as a type of curse that can not be bitten by viper while walking in the mountains because there were many people who made charcoal in the mountain village at the time. 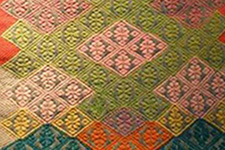 Compared to West Kogin, there was a monotonous pattern and a simple composition on a roughly woven cloth with thick linen. In this area, Koginzashi’s penetration rate is low. (at that time it is thought that cold damage crop production frequently occurred and Kogoinzashi could not afford life) There are few Koginzashi left. The modernity that arranges a bold thick line that sticks 3 thick horizontal stripes with white and black on the back from the shoulder and the upper part of the chest is a feature that can be seen only in this region. In the Edo period, there was a short work wear of a single clothing of hemp by farmers, called kogin（小巾）. 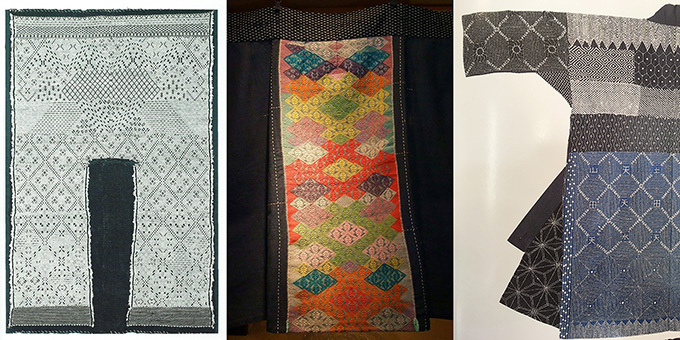 These kimono which reinforced by stitching thread was called “tudure – sashi” or “sashi – kogin”. Imperceptibly, It has been said that sashi-kogin became able to be known with “kogin”. The Tsugaru-han in the Edo era did not allow farmers to wear cotton or silk due to a strict frugality order. So, the farmers were wearing hemp clothes as work wear that could only self-sufficient material. 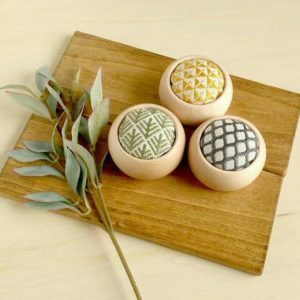 It is said that the beginning of koginzashi started stetching sashiko with hemp thread to achieve even a little even durability and heat retention, which is not a perfectly suitable material as a warm clothing. In the Meiji era, thrift orders were solved and cotton became delivered to farmers. Due to its remarkably different heat retention and durability than hemp, it slides well as a sewing thread. 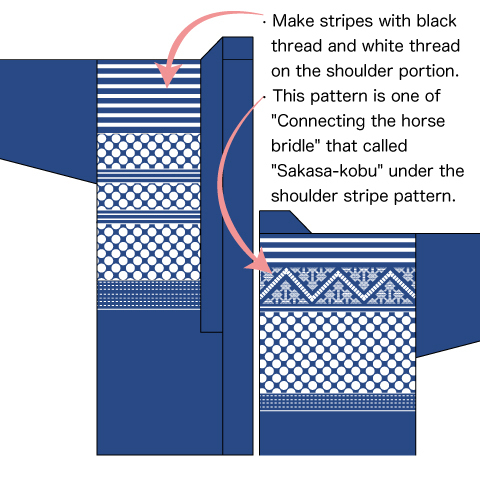 Because of the ease of working of sashiko, koginzashi has been progressed technique with cotton thread suddenly. However, it was also a short while, as a result of the opening of the railway, highly functional cotton fabrics not requiring sashiko were readily available. Koginzashi declined abruptly around the Meiji 28th in the peak period. It is said that it was hardly doing at the end of Meiji. * The magazine “Kougei（工芸）” was launched in January 1931 as an institutional magazine of Mingei（民藝） movement, and was published as a monthly magazine up to the final volume of No. 120 in January 1951. It was the magazine ‘Kougei’ No. 14 in February of 1960. It was announced that a signs of resurgence in the declining Koginzashi. Mr. Yanagi became fascinated by Tsugaru Kogin that was introduced from the student from Aomori at the beginning of Showa, and started researching and collecting. These culmination was an announcement at “Kougei” No. 14. There are a lot of people who are enjoying Koginzashi in instagram. If you look for it with “# kogin” you can find a lot. @hitoharico215 also introduces a kind of Koginzashi that I want to touch in blogs. @milk.1231 will deliver the koginzashi that plus a little bit of newness, Scandinavian style and traditional koginzashi. Blog is here. 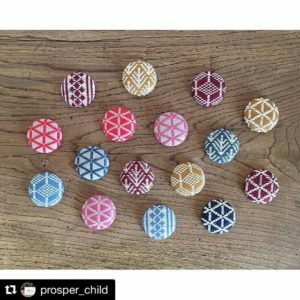 @prosper_child is making lots of colorful and cute Koginzashi. 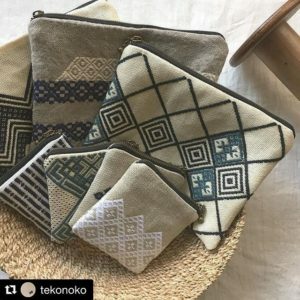 @tekonoko produces her original koginzashi accessories with a novel composition of tradition. In around 1935, the nationwide craft reconstruction activity occurred. Even in Hirosaki city the kogin Promotion Society was formed in 1943 and began spreading the traditional craft of Koginzashi. 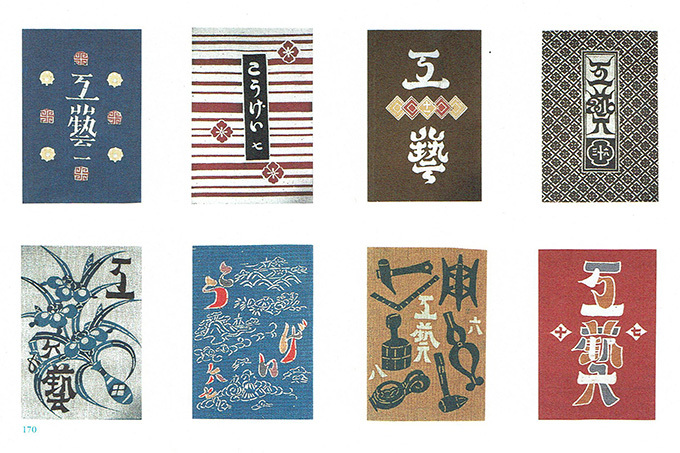 Many books have been published for enjoying kogin as a colorful hobby handicraft by increasing color variations due to the influence of the folk art boom around 1965. Kogin lovers appeared, works of koginzashi were released overseas as well. While continued popularity continues, in recent years there are also influences of the hand-made boom and the distribution of koginzashi classroom in various places, distribution of koginzashi production kit, in recent years koginzashi · hishizashi is not limited to Japan, everyone in the world know handicraft lovers It is getting.